Put carrots, turnips and celery in water and bring to a boil, then simmer for 10 minutes. Add the rest of the ingredients, return to boil, then reduce heat and simmer for another 10 minutes. 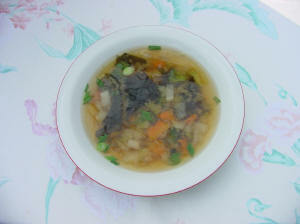 Dilute the miso with a small cup of the broth and simmer for a couple of minutes (do not boil), garnish with scallions. Serve. Wash and strain rice. 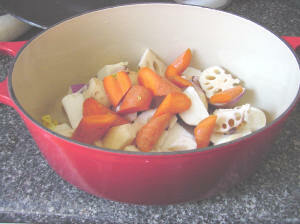 Layer vegetables in a pressure cooker, add rice on top and pour water in a circular fashion around the walls of the pot so the vegetables are not disturbed. Add salt, seal and bring to pressure. 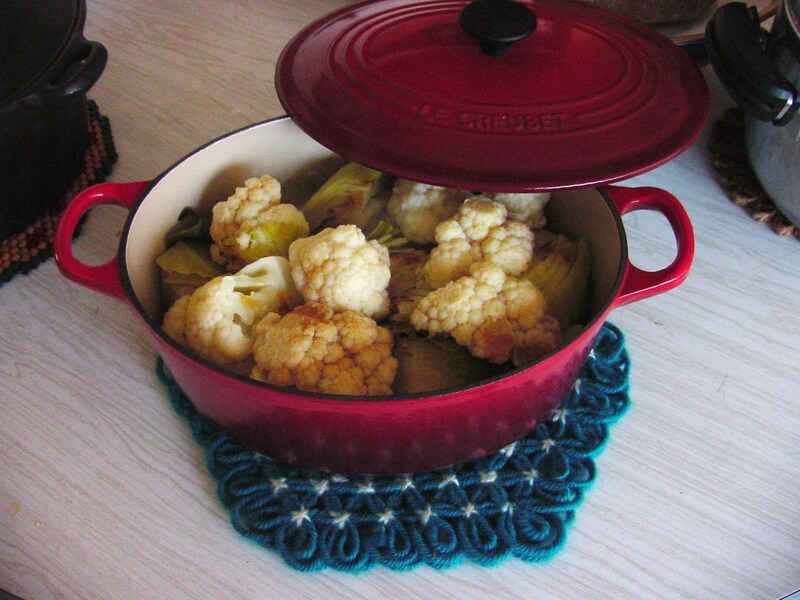 Lower heat and add flame deflector to prevent burning, cook for 45 minutes. The dish can be consumed this way and it is delicious. To make the bread, as you see in the picture, turn the cooked ingredients into a food processor and puree. 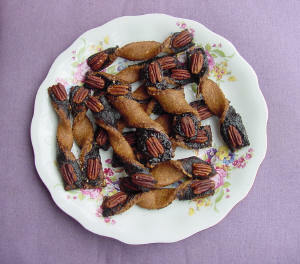 Then refrigerate for more than 24 hours (minimum 30 hours). Oil and flour a baking sheet and preheat oven to 400° Fahrenheit. Just before cooking, take the mixture from the refrigerator and add enough flour so the consistency is like a dough and can be scooped with a small ice cream (yuk!) scooper. 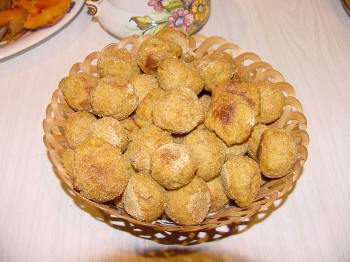 Put balls on sheet allowing room for them to rise a little and cook for 20 to 30 minutes, until they look golden and delicious as in the photo. Serve cold or hot. Cut tempeh into little squares or triangles. Heat oil and fry tempeh until it is golden. Drain on paper towels. 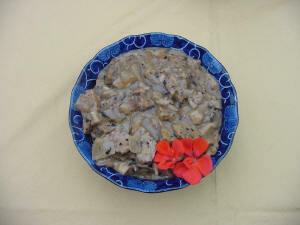 In a saucepan, fry onions in a little oil. Then add tempeh, water or stock, and seasoning. Bring to a boil and simmer for 20 minutes. Add mushroom and cook for another 5 minutes. Then add diluted miso, melt kudzu with a few tablespoons of cold water and pour in, mixing well. Cook for a few more minutes and serve. Wash all vegetables, using plenty of water, then drain. Diagonally cut the celery into thin slices. Tear romaine leaves into small pieces. Chop the escarole into one inch pieces. Cut radishes in thin rounds. 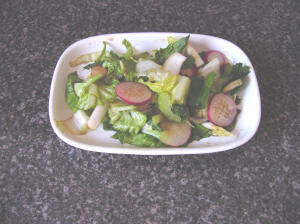 Chop the radish leaves, about in half. Chop the fennel into strips. Combine and toss all ingredients together, adding about 3 tsp sea salt. 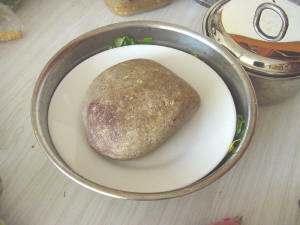 Press (Rosanna uses a bowl, plate and stone as in the picture at left) for one hour. Wash out salt and strain out excess water. Add a few drops of umeboshi vinegar and serve. Wash and cut vegetables in big chunks. Put kombu in heavy pot and layer vegetables on it. Add half cup of water. Cover with heavy lid and bring to a boil. When a good amount of steam is generated, lower the flame and simmer for 15 minutes. Add soy sauce to taste, continue to simmer another 5 minutes, or until the vegetables are soft. 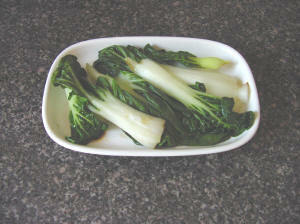 Pull the bok choy apart and rinse carefully (they are always full of sand). Steam it for two minutes, add a pinch of salt or sprinkle with a little soy sauce. Serve. Dissolve yeast in a half cup of warm fruit juice and let stand 5 minutes. Add enough flour to form a thin batter and mix well. Scrape down the sides of the bowl, cover and let it rise in a warm place until it doubles in size. Beat in oil, vanilla, and rice syrup. Add the rest of the flour, cinnamon, sea salt, and zest. Knead well, adding enough fruit juice to make a sticky dough. Place in a bowl, cover and let it rise again until it doubles in size. Roll out dough in a rectangular sheet about ¼ inch thick. Cut away uneven edges and spread peanut butter and then jam on top. Then cut into strips with a rolling ravioli cutter and twist each end of the strip in the opposite direction as you see in the picture. This will form a bow, the fillings should be face-up. Place on an oiled and floured cookie sheet and let it rise again. Bake in a preheated oven at 350° Fahrenheit for 20-30 minutes. Serve your special dinner!